Meadowbrook Woods Estate Home. This beautiful colonial offers 5, 637 square feet of finished living space on a nearly one-half acre corner cul-de-sac lot. The home features 4 spacious bedrooms and 3.5 bathrooms, a huge gourmet kitchen with granite counters, Center Island, stainless steel appliances, gas cooktop, double ovens, butler~s pantry and more~ Come home to your grand foyer with gleaming hardwood floors, a real sense of arrival. Formal dining room with hardwood floors, crown molding, wainscoting and plantation shutters. Enjoy family gatherings in the oversized family room with fireplace, open to kitchen and sunroom, or work from home in your own office with atrium doors for light and privacy. Upstairs you will find a Master Suite with sitting/dressing area, en-suite with soaking tub, separate shower, dual sinks and a closet big enough so even he can keep his clothes there. A Prince/Princess bedroom with full bath, and two other generously sized bedrooms including a Jack n~ Jill bath round out this perfect home. 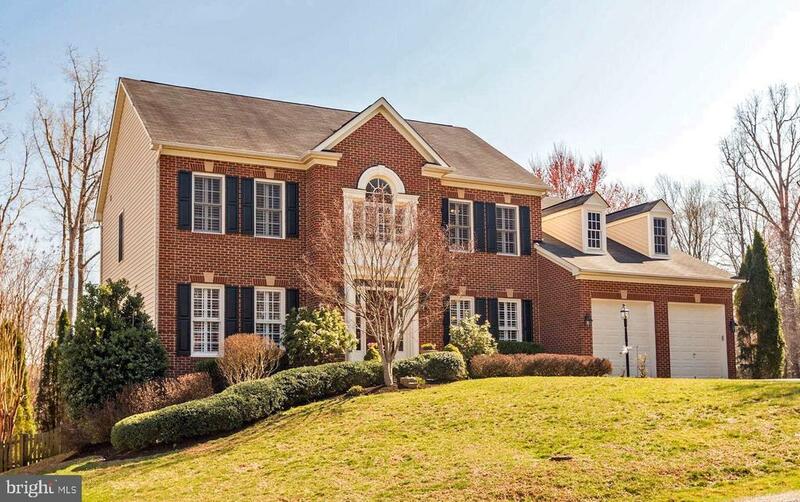 Full walkout basement with pool room; theater (projector/equipment convey); large recreation/game area; full custom wet bar with wine refrigerator, dishwasher, bistro table are; fitness room; full bath and storage area. An audiophile used to live here and this home is wired for sound and speakers! Walk out of your basement to the dyed/stamped patio and stairs leading up to your oversized deck for summer outdoor entertaining. The deck overlooks your expansive rear yard (nearly ~ acre home site), with only one neighbor next to you. You may have seen many neighborhoods labeled as ~sought after~, but Meadowbrook Woods truly is a prime Prince William County community. Located in one of the best county school pyramids of Marshall Elementary, Benton Intermediate and Colgan High School. Meadowbrook Woods also offer estates size home sites (.5 ~ 1.5 acres), community pool with swim team, tennis and basketball courts, and playground. Spend a lazy afternoon fishing at the community pond, or just strolling through this great neighborhood. This home has it all! Come on out and visit today.